As the Smithkowski’s were heading out to our second Cubs game of the weekend, Brady said to me, “Who ever thought we would come back from Mexico to warmer weather in Chicago.” He couldn’t have said it better. Ever since we got back from our honeymoon, it’s been miserable in the non-Windy City. High humidity and temps = cranky Chicagoians. The citizens here are never happy about the weather! 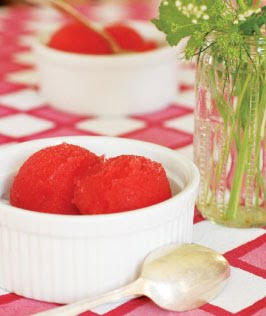 While I saw this recipe for Strawberry Prosecco Sorbet from the Imbibe Magazine blog, I thought it would be perfect for Thirsty Thursday. It’s refreshing & bubby and I LOVE ice cream AND Prosecco! This “drink” was part of a feature on boozy ice cream recipes – but I love that you can make this a sorbet OR a granita (kinda like an Italian Ice). Set up a double boiler by arranging a stainless steel bowl over a saucepan filled with 1 to 2 inches of simmering water. Put the strawberries and sugar in the bowl and stir occasionally until the sugar has dissolved. The berries will have broken down slightly but shouldn’t be mushy. Remove the bowl from the heat. When the berries are cool, purée them. Add the prosecco, lemon juice and a pinch of salt. Makes 1 pint. Freeze according to your ice cream machine manufacturer’s instructions. For granita:Pour the mixture into a shallow pan approximately 8 by 8 inches and place it in the freezer. Every 30 minutes for the next 2 to 2 1/2 hours, roughly stir up the mixture with the tines of a fork until no liquid remains and the granita has a light, icy texture. Freeze until completely frozen, 8 hours to overnight.